I was born in 1985, in Sydney, Australia. While I have not had any formal art training or education besides school, up to the HSC; I am extremely passionate about art and all forms of emotional and intellectual expression. Art for me is a form of therapy and a huge release; without it I doubt I would be able to function at all. I like my work to be contemporary and unique, as I believe that the combinations of subject matter in my work are totally different to that of any other artist. Therefore I want the total outcome of my work to be totally unique, this includes my style and effects produced in my work. Pollock once said something like; in a time of things such as the radio, the atomic bomb and the airplane; we need new forms how could techniques of periods such as the renaissance and others of the past possibly hold any significance to a modern society. My art is often about life, time, society, my thoughts, feelings and emotions, philosophy, elements of human nature, ideals and ideas, irrationality, greed, hate, frustration and anger. I usually work on canvas, using acrylic paints and impasto medium or ammonia to change the consistency of the paint. 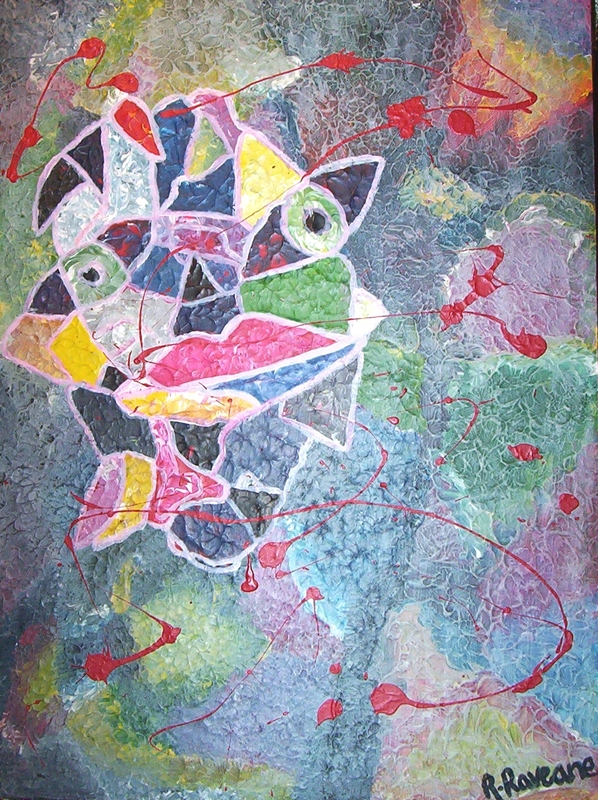 Also, I often use various items of mixed media imbedded in paint and/or impasto for the purpose of texture. I believe that all elements of art should come from within the artist and that what others think of it should only be considered upon completion. The awards I have received for art are nothing compared to that of others featured on this site, but I guess that's okay because my time in existence is also pretty close to nothing in comparison. Nevertheless, I received first in Visual Arts almost every year I was at school (2000, 2001, 2002 and 2003); I was awarded by the Penrith Show (2001 and 2002) and I was awarded 'The Visual Arts Award' For Excellence in HSC Visual Arts, from Bossley Park High School (2003). I currently live in Abbotsbury with my parents, brother and pets, I have a fairly large studio under our house. I have an extremely boring and repetitive job working at a pharmacy in Liverpool, Westfields; the good thing is that I am making money while looking for better work. I am happily single with really great friends and family. I plan on studying something to do with art or design half way through this year or early next year. I have always wanted to be an artist and at 18 years of age, even though I work full- time, I think I can finally say that is what I am. Fairfield City Art Society Inc.